Other people want this. 9 people have this in their carts right now. Choose your color(s) from the drop down. Picture #1 - Shows ALL the colors available. Transparent Medium Blue, Transparent Intense Blue, Transparent Lavender Blue, Transparent Red, Transparent Yellow, Transparent Lavender. Flower sizes vary but are mainly 1" - 1.25" across and 1" - 1.25" in depth..... mandrel length is about 6". I use Effetre Transparent Glass in a variety of colors. Each flower is done one at a time so there are some variations. (Stock Photo) May have slight color variations due to different suppliers. Please state the color you desire. I digitally measure my beads for accuracy so please be sure in regards to the sizing of the beads before you buy. I try to capture the trueness of my colors in my pictures and use natural outdoor lighting when I can. Monitors may vary the colors slightly. Thank you for looking ! All my beads are made by myself one by one in my Glass Studio in Upstate NY, USA. They are digitally annealed for strength and durability, hand cleaned and packaged for a safe journey to you. It’s beautiful!! Very talented. I would love to order more flowers - thank you! Small, lovely, delicate and expensive for what you get. 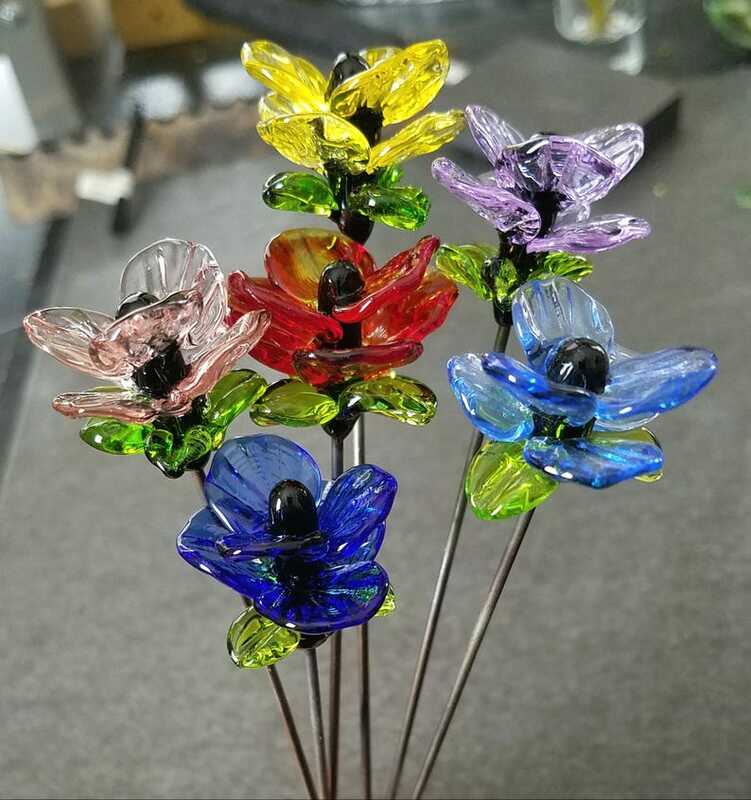 Do to the nature of my work, some items are made when ordered ~ these items are carefully made one by one in glass, they are not mass produced, therefore returns are not accepted. I try to best describe things as they are but if you have a question, please ask ! I will ship First Class Mail and Priority Mail in the United States, along with a small handling and packing fee.... and will gladly ship anywhere else (INTERNATIONAL) just let me know and I'll figure the shipping before you buy ! All items are carefully wrapped in tissue and bubble. Some larger items come gift boxed. I package my work safely and securely. I have had no problems in the past, although insurance is optional with First Class Shipping. Once I take my work to the PO, it is out of my hands and I can not be responsible for loss or damage. (Not responsible for mishandling in the mail). Glass items are all made by hand and have been annealed but remember that they ARE glass. They will hold up to normal everyday wear.